Focused and undeterred by the incessant heat one October afternoon, tennis player Cody Duong sends the ball over the net with a resounding hit of his racket. Duong stands out amongst his teammates by his intensity and passion prominent throughout the practice. This year, Duong was chosen by coaches around the nation as the recipient of the prestigious Arthur Ashe Award. The Arthur Ashe Leadership and Sportsmanship Award is given to students who have proven themselves to be outstanding, committed and hardworking members of their team and outside communities. The award is given in association with the Intercollegiate Tennis Association, and is targeted towards college level tennis players across the nation. The young athlete is also a three time All-American winner, making Duong American River College’s first student to receive these awards. Duong also won several ITA preseason tournaments in both the singles and doubles division during his time at ARC. 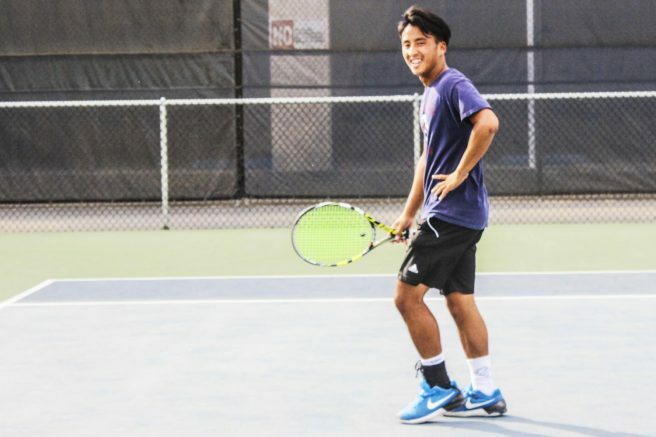 After his family moved from Oakland to the Sacramento area, Duong quit tennis after playing throughout his childhood until his fellow classmates encouraged him to pick up the racket and play for the team at Florin High School. This choice proved favorable—Duong was undefeated for three consecutive years on his high school team. Duong’s two older brothers played a part in his decision to dedicate a majority of his childhood to the courts—they inspired him play tennis and follow in their footsteps. Duong’s brothers played tennis throughout high school and college, and “seeing my brothers play got me curious,” Duong said. Duong spent many an afternoon filled with practice while he unknowingly prepared for a long and strenuous athletic career. Duong’s brothers also pursued tennis after graduating college—one of Duong’s brothers is currently the assistant men’s coach at ARC. Duong shows his ambitious side while participating in tournaments and games, and is a self-proclaimed competitive player, yet he hasn’t always felt that way about the sport. “I didn’t enjoy competing as a kid, but I grew to accept losses,” said Duong, which increased his drive to excel while competing. Now, it’s a different story. Duong has become increasingly motivated as his involvement with tennis has increased, and has launched him into a heavily decorated path towards university-level competition. “It’s not that I love to win, but I absolutely hate to lose,” Duong said. Duong’s dedication for the sport and his team is obvious—the support that Duong, his coach and his fellow teammates provide for each other is undeniable. Shouts of encouragement reverberate through the courts as the team relentlessly send serves over the nets. Some of Duong’s favorite aspects of tennis include the people he’s met while playing the sport. “The friendships that are created, and how tennis teaches you to handle everything in life,” Duong said, expressing his love for the sport and the brotherly camaraderie of the team. Throughout high school and college Duong’s coaches motivated and inspired him, acting as mentors both on and off the court. The athlete’s coaches focused on “more than just tennis,” Duong said, and have supported him in all aspects of his life. Bo Jabery-Madison, ARC’s men’s tennis team coach and Beaver alum, said Duong “…epitomizes what a student athlete should be.” Jabery-Madison also applauded Duong’s dedication to the sport. Madison has been the men’s tennis coach for the past 13 years, and has coached Duong through his time playing for ARC. “He has a great work ethic, everything he does in life is done with impeccable integrity and he works well with others and makes those around him better,” Madison said. Madison complimented Duong’s abilities on the court, but off the court as well. “His talent and ability level in tennis have garnered him the rankings, accolades, and attention, but it is his life skills and sense of character that will lead to his success in life beyond the tennis court,” Madison said. After an award-filled two years, Duong will be transferring to San Diego State this fall, and is currently playing out his final season here at ARC. Lily Rodriguez Drake is a second semester staff writer for the Current.She has a background in history and intensive research at universities including the College of William and Mary and Hawaii Pacific University. She is pursuing her major in Journalism while concurrently minoring in Anthroposophic studies. Be the first to comment on "ARC tennis player wins prestigious Arthur Ashe Award"